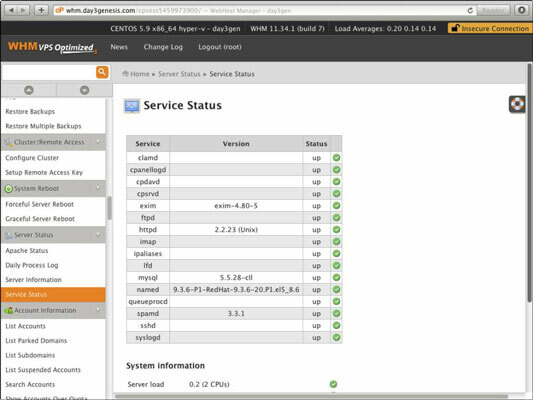 The beauty of a web hosted server is that each of its major functions has its own “service” that you can restart. A service is a piece of software — a program that runs on the server handling a particular function. If one of the services stops functioning correctly, you don’t necessarily have to reboot the entire server. You can simply restart the service that has broken. To view the current status of services on your server, scroll down to the Service Status section of WHM and click on Service Status. You see a screen which lists each service with a green checkmark next to it if it is running correctly or a red cross if it has a problem. Scroll down to the Restart Services section. Find the service that currently has a problem and click it. Click Yes to confirm that you want to restart the service. Watch for the status message that tells you that the service is being restarted and then reports whether it was successful. If the restart is reported as successful, scroll back up to the Service Status section and check the service status again. If the restart was not successful, contact your host for support. You need to do the same process for each service that is not running. Sometimes a service may say that it is running correctly but may have an issue anyway. I have found this happens repeatedly with some of the mail services. Restarting a running service to try to clear errors is not a problem unless you are in the middle of running another command in WHM that expressly forbids you from doing so.